Officials filed charges against a man who caused a deadly crash on I-90 Sunday morning. CLEVELAND — Officials filed charges against a man who allegedly caused a deadly crash on I-90 Sunday morning. Police said Christopher Jackson is charged with aggravated vehicular homicide, aggravated vehicular assault, receiving stolen property, operating a vehicle impaired, possession of marijuana and failure to operate in marked lanes. The crash happened around 3 a.m. on I-90 east at MLK Drive and Eddy Road. The highway was shutdown while crews investigated. Officials said a 2000 Mercury Grand Marquis, 2001 Dodge Ram pick-up with a fifth wheel trailer attached and a 2019 Kia Sportage were involved in the crash. The occupants of the Mercury Grand Marquis and the Dodge Ram were both outside of their vehicles on the right shoulder of the freeway attempting to load the Grand Marquis onto the trailer of the Dodge Ram. The Sportage was traveling eastbound on I-90, when it drifted onto the berm and struck both pedestrians on the shoulder of the road, according to the Ohio State Highway Patrol. One of the pedestrians, 50-year-old James Blankenship, was killed. His 26-year-old son was seriously injured. Both men were transported to University Hospital. The 36-year-old driver of the Kia Sportage was transported to University Hospital with minor injuries. After the initial crash, the unoccupied Kia was struck by an unknown vehicle that continued after the crash without stopping, according to OSHP. While on scene, two Bratenahl officers in marked vehicles with lights flashing were struck from behind by another eastbound vehicle. 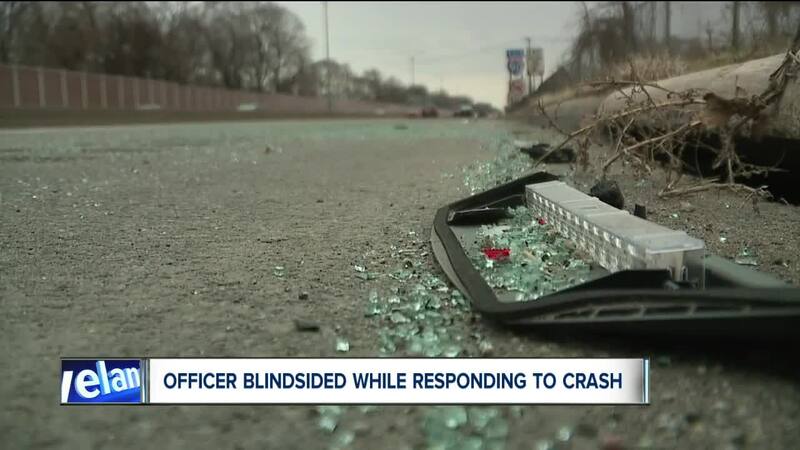 "Certainly, by him placing his vehicle in the path of the impaired driver who struck him from behind, he saved the lives of everyone beyond him," said Lt. Rob Gable with the Ohio State Highway Patrol. Bratenahl released body camera video from the scene. The cruiser was pushed into another vehicle, that struck a fourth vehicle that was waiting in traffic. The officer struck in the patrol car was transported to the hospital and released. The driver of the car that hit the cruiser was transported to the hospital. The Kia Jackson was driving was a rental car that had been reported stolen, according to police. More charges could be filed in connection with the string of crashes.